Travel on the KTM Kuala Lumpur Batu Gajah Train. Please Note : From the 19th May 2016, there are no longer any of the older Intercity trains on this route, as they have all been cancelled on the North - South Railway Line, north of of Gemas. All services will now be operated by ETS Train only. Please Note : These Intercity Trains have been cancelled from the 19th May 2016. The high-speed ETS Trains leave KL Sentral Station frequently throughout the day for Batu Gajah. These are the cheapest options, but also the slowest. You have a choice of either the faster (less stops) Gold Service or the slightly slower Silver Service. 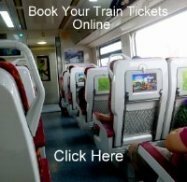 Advance tickets for Intercity services area available from any KTM station within Malaysia or you can book your Intercity or ETS tickets online from the KTM website or for a slightly cheaper option, through an online ticketing agent.